The owner of this house in the town of Kislingbury, Northampton called me in because her sealer wasn’t performing very well and the floor had only been cleaned and sealed 6 months previous by her builders contractor. Although the rest of the floor was in very good condition there were quite a few tiles that were being easily scratched from day to day use and stained from liquid spills which should have been easy to remove. 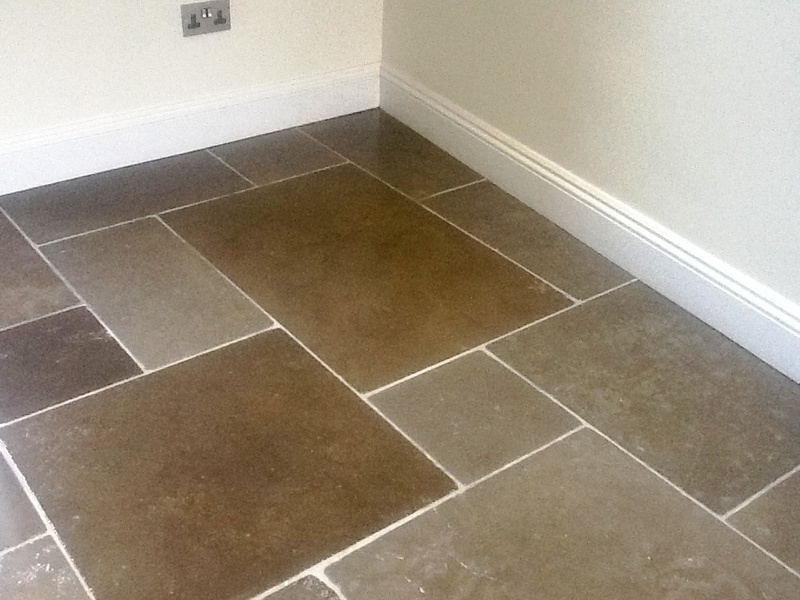 It isn’t always the case that a whole floor is in poor condition, it can be just the high foot traffic areas or just a few damaged tiles either way it can spoil the appearance of the entire feature. Upon initial contact with my client, we talked through the work the previous contractors had carried out. Then, upon testing the affected areas of the floor, I discovered that that the sealant had been applied very patchily, meaning it had better coverage in some areas than others. 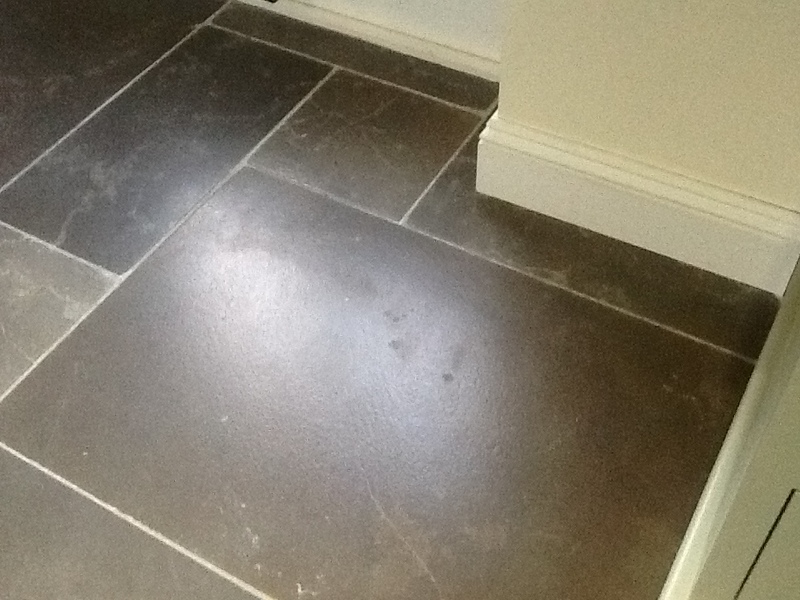 I also speculated that the underfloor heating in the room may have affected the curing of the sealant as it dried. Even though this work was carried out in January, with outside temperatures of -2 degrees, I insisted that the underfloor heating was turned off to eliminate the potential of it impacting the performance of any products used during the restoration. I began by stripping off all of the old sealer with the coarse pad from the Tile Doctor burnishing system. I then diluted a solution of the high alkaline cleaner Tile Doctor Pro Clean and this was mainly applied to clean the grout lines because as I previously mentioned, the condition of the tiles was generally speaking very good. The solution was allowed to dwell for approximately ten minutes, before I proceeded to agitate the area with a scrubbing brush to remove ingrained dirt. The floor was then finished off using the rest of the pads in the burnishing pad system to restore the surface shine and then rinsed down with water to remove the slurry. 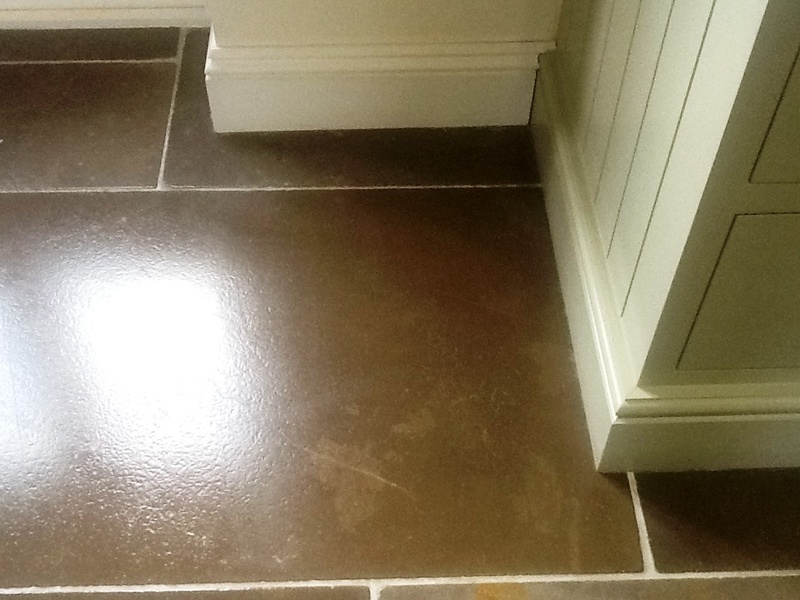 After allowing the floor adequate time to dry, I sealed it with Tile Doctor Colour Grow, an impregnating sealer which provides not only a durable surface seal, but also contains properties which intensify the natural colours in the Limestone. I completed the seal with the underfloor heating off and this allowed the sealer to cure properly. Just to make sure, I also tested several different areas for water repellency – it was only after that I allowed my client to put the heating back on! The photos really show the difference made in the appearance of those areas of the floor that were once stained. 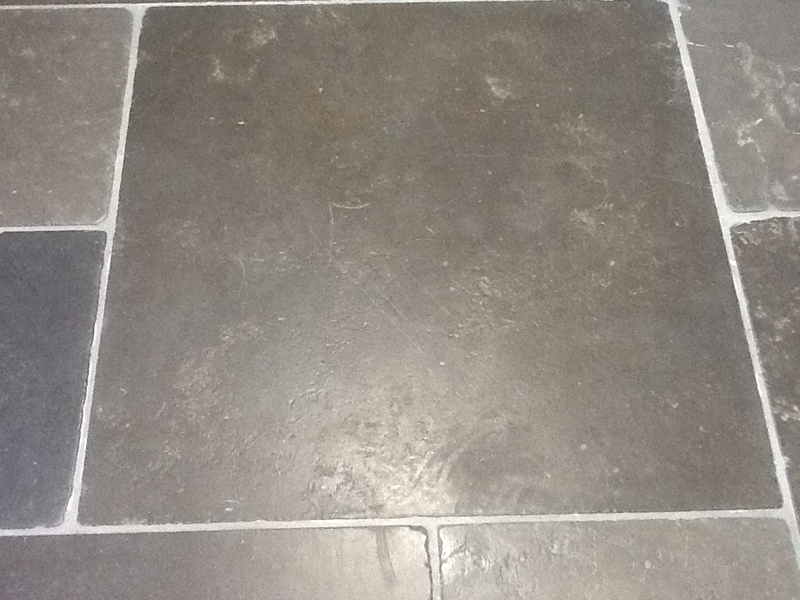 Needless to say that the several days of work were really worth it to get this Limestone tiled floor back to looking its best. With a deep clean and robust, properly applied sealer, this floor will be protected against damage for a long time to come.